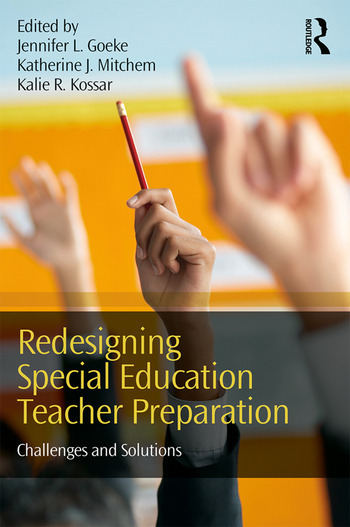 Redesigning Special Education Teacher Preparation describes both challenges and possible solutions to redesigning and restructuring high-incidence teacher preparation programs so graduates will meet the Highly Qualified Teacher requirements and be prepared to teach students with high-incidence disabilities. This powerful new text discusses many possible reforms, including field-based teacher preparation, a focus on evidence-based core practices and teacher moves, collaboration with K–12 school-based partners as teacher educators, interdisciplinary collaboration across university faculty, and a grounding in current expectations for high-stakes accountability and program evaluation. Part I High-Incidence Teacher Education Program Redesign and Restructuring 1. The IRIS Center: A Federal Investment to Support and Improve Personnel Development 2. Preparing Teachers to Use Culturally Responsive Practices Part II Building the Capacity of School Partners 3. Project RTI 4. Finding Common Goals within National and State Policies Impacting Collaborative Teacher Education: Renewal of Program Elements and Faculty Roles Part III Collaborating with General Education Colleagues 5. Collaboration in Teacher Training: Hurdles Crossed and Lessons Learned Part IV Creating a Culture of Continuous Improvement 6. The Detours and Pit Stops on the Road to a High-Quality Teacher Preparation Program 7. Merging Disparate Paradigms: How Do Evidence-Based Practices Fit with What We Know about How Students Learn Best? Part V Program Evaluation in an Era of High-Stakes Accountability 8. Beyond Knowing: Scaffolding Field Experiences to Enhance Candidates’ Shift to Independent Identification, Application, and Evaluation of EBPs 9. Special Education Teacher Candidate Evaluation: Creating a Pre-service to Master Teacher Observation System Part VI Creating Sustainable Innovation 10. Strengthening University/School District Partnerships: Getting Everyone on the Same Page 11. Funded: Creating a Sustainable Dual Educator Preparation Program Conclusion: What Is the Future of High-Incidence Teacher Preparation, and How Can Effective Components of 325T Projects be Applied to Teacher Education Models? Jennifer L. Goeke is Associate Professor of Special Education at Montclair State University, USA. Katherine J. Mitchem is Professor of Special Education and Edith L. Trees Endowed Chair, California University of Pennsylvania, USA. Kalie R. Kossar is Associate Professor at California University of Pennsylvania, USA.